Are you frustrated by lack of performance of your back office processes, but aren’t sure what’s causing your issues? The time wasters that are easy to uncover and address in the contact center are far less visible in your back office. But with the right approach and right tools, you can set reasonable productivity goals, eliminate some of the unplanned, non-productive time in your back office, and take your performance to the next level. Determine what your people are doing before you create your productivity goals. If you can’t track the desktop activity of your people, you can’t get a handle on your potential productivity. You can walk around your back office processing facility and observe what seems like too much down time, but without the right tools, you can’t adequately quantify what your productivity levels are and how time is being wasted. One way to gauge productivity is to establish goals and measure your analysts against them. If the goal is to finish 100 work items per week and 100 are finished, then the analyst is 100% productive. If she does 90, she’s 90% productive, 110, then 110% productive, and so on. Your employees may ostensibly be meeting their productivity goals, but are the goals themselves what they should be? Parkinson’s Law is the well-known adage: Work expands so as to fill the time available for its completion. Many back office managers know this to be true. Traditional methods for measuring productivity—tick sheets, time and motion studies—do not adequately measure productivity and may encourage employees being observed to slow their productivity. Approaches to measuring and increasing productivity that have been proven in the contact center are increasingly tailored to and available for the back office. Measurement technologies allow companies to accurately pinpoint the amount of unplanned downtime and its causes, while complimentary solutions can help drive productivity to levels that are seldom realized in the back office. Some of this downtime is planned, required, and won’t go away—internal meetings, break time, etc. It is vitally important that you understand how time is being spent in the back office if you are to create aggressive, yet achievable, productivity goals—as well as manage an optimal amount of unplanned non-work activity for your employees. This allows your employees to increase their work efficiency and your business to leverage your workers’ productivity, maximizing efficiency and profits. Look for low-hanging fruit and eliminate some of the unplanned, non-productive time in the back office. Technologies now exist to give you visibility into your true productivity. Now it’s time to find quick wins in your processes. Can you see how often and how long your employees’ desktop PCs are idle or locked? Are PCs idle because analysts are working on a process that doesn’t require PC time, or for some other reason? Digging into your utilization statistics will help you uncover opportunities. As mentioned earlier, 40% of your potential processing time is spent on non-productive activities. Employees typically spend 20 hours online a week—five hours of which is surfing non-work related sites. You might be surprised at the industries that waste the most time. Is your industry among those below? Managing employees’ internet usage is not as straightforward as simply restricting access to the most time-consuming sites, which include Facebook and LinkedIn. Most knowledge workers require reasonable access to the internet in order to do their jobs, and employees expect to be able to access leisure sites at work—within reason. Instead, think about how you can make incremental improvements in the efficiency of your back office by establishing reasonable internet usage goals. Even modest productivity gains can quickly bring big profits to your operation. Analyze the data you have collected and look for trends. With this information, you can now look for ways to improve your performance. 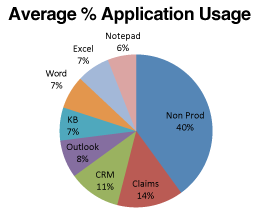 Many back office processing environments would produce usage statistics like those above. As mentioned above, some of the non-productive time is internal meetings, training, one-on-one coaching, bathroom breaks, etc. But some of this is wasted time. If you suspect excessive unauthorized time in your environment, here’s a great place to start. If you can recapture just 36 minutes of the 180 minutes of daily unproductive time, assuming you have a 500-person back office operation, you can recapture a substantial profit for your organization. The 36 minutes a day of recaptured production time represents a modest fraction of an individual’s work day, and still allows for 144 minutes of non-productive time per day. Do you think this is achievable in your back office? NICE Systems client Fidelity Information Services (FIS) is a key player in the debit and credit card processing industry. Based in Brazil and already a NICE call center customer, the company sought help from NICE in finding deeper insights into its back-office processes and employee workloads. FIS needed a solution to monitor activities in a mainframe-driven back office environment, adapt quickly to new types of claims and business requirements, and operate with minimal IT requirements. NICE created a real-time impact solution for FIS that included activity monitoring and process optimization. With NICE’s help, the company was able to analyze their processes and give attention to the processes with the most potential impact. “NICE helped us choose the right processes for automation and error reduction,” said Marcelo Soares Dabés, FIS Brazil Operations Executive Director. “They were instrumental in helping us focus on the 20 percent of processes that would give us the 80 percent of the gains.” The company was able to reduce credit card refund claim processing time by 81 percent. Employees are happier at work because they are able to avoid repetitive tasks and reduce their own errors, allowing them to focus on claim analysis and less on manual processes. These days, companies are exploring application monitoring as a way to quickly reduce unproductive time. Application monitoring provides insight into real-time desktop processing activities, both at the individual and departmental level. Back office managers who have moved over from contact center operations are already familiar with the benefits of application monitoring. When you have insight into how employees use their desktops applications, you can uncover waste and also look for best practices in existing processes. Looking into your high-use processes, you can look for ways to streamline these processes and enable employees to proactively avoid errors and rework. Process optimization also involves automating manual steps to enhance processing efficiency and ensuring compliance with pre-defined workflows that may span multiple applications. With the right approach, you can quickly find your productivity sweet spot and uncover opportunities for improving your back office processing. By documenting your processes, gradually eliminating waste in the process, and implementing best practices, you can increase compliance, increase capacity, and boost your organization’s productivity and performance. Copyright ©2013 Society of Workforce Planning Professionals. All rights reserved.